October 31, 2016 – Carbondale, IL – Com-Pac International, Inc., a leader in the design and manufacture of reclosable packaging solutions, will be exhibiting at Pack Expo 2016 this November 6th through 9th, at McCormick Place in Chicago. Visit us at Booth #E-8017 (Lakeside Upper Hall) as our capable team will be available to answer questions and discuss the latest developments in the company’s extensive list of products and capabilities. This year, Com-Pac will be exhibiting our Integra® RTR-1000 Pre-Applied Zipper Application System. 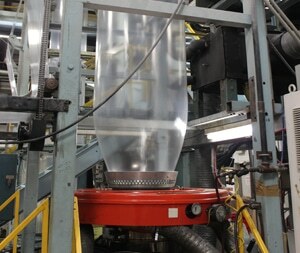 This system applies zipper to packaging rollstock, creates a tamper-evident opening perforation, and rewinds the zippered film for use on VFFS and HFFS baggers. **BONUS** This year we will be offering our Demo Model RTR-1000 for sale as a show special! These units normally sell for $249,900, but during the show only we are asking only $174,999. Come by and see for yourself why the proven Integra pre-applied zipper application system technology is the right package for your operation! Com-Pac’s Integra BP-I is s backpack zipper application system which mounts directly to your VFFS bagger and applies the zipper to your film web just before the film travels down the fill tube. Com-Pac will also be demonstrating our new Fresh-Zip® Zipper-Tape being applied to package film on a Pacmac 9500 VFFS bagger. Our patent-pending design provides twice the product-side opening force for products such as frozen poultry, fresh-cut vegetables, sugar and many other IQF products. Stand-up Pouch Zippers – 10mm and 20mm ribbed and non-ribbed zippers for cost-effective, high-speed zipper application on all laminated substrates typically used to make stand-up pouches for pet treats, candy, dried-fruit, nuts, and jerky. Liquid, Air and Vacuum-tight Zippers – Super high integrity zipper for all barrier applications with extraordinary internal opening force, yet easy to open from the outside. Double Zippers – Consumer-friendly double lock design to enhance tactile feedback when closing with added assurance of positive closure. Horizontal and Vertical FFS Zippers – Economical single and double flanged for use on all HFFS and VFFS baggers designed to maintain maximum product freshness and easy clean-out of profile closure. String Zippers – Low cost zippers compatible with all in-line zipper application units offering easy-to-crush material for faster cycle speeds and improved side-seal appearance and performance. Biodegradable Zippers – Made with patented TDPA® are 100% degradable within 12 – 24 months when disposed of in a landfill or soil in the presence of oxygen, heat and stress. Complies with ASTM D6954-04. Inno-Lok® Zippers – Liquid and air-tight zippers designed specifically for Inno-Lok pre-zippered applicators offers easy crushing and efficient sealing speeds. Com-Pac International’s zipper rollstock is compatible with nearly all zipper application systems including Totani, Zip-Pak, Sunshine, Waterline, Hayssen, Bartelt, Bosch, Triangle, Ro-an, Hudson-Sharp, Park-Air, RD, Mamata and others. While our competitors may offer their standard zipper profiles, Com-Pac specializes in custom-made zippers designed for your specific application using profile dies which are cut on our in-house wire EDM equipment and manufactured on our state-of-the-art profile extruders…..and all of our products are manufactured in the U.S.A.
Com-Pac resealable zippers can be manufactured in any PMS color desired and we offer a zipper spool recycling program to help reduce your environmental impact. Be sure to stop by Booth #E-8017 and see the many packages which use Com-Pac zipper and pick-up some samples for yourself!